treats the guests to a more generous and intriguing arrival. Fortunately, the Health Department does not count open porches as an expansion of the house, so we added a new wing that is both the guest's entry and the family's river-oriented screen porch. 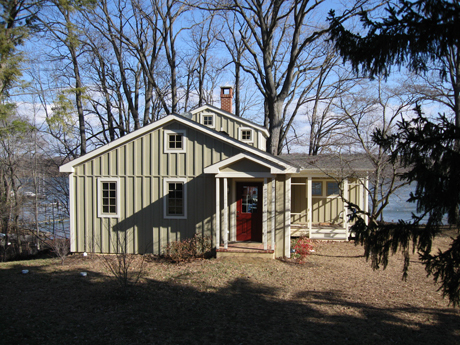 In this unusual design, the two porches are separated by a wall as if one porch is exterior to the house and the other interior. Two windows in that wall frame views in both directions. These windows also allow the Owners to control the cooling effects of breezes. 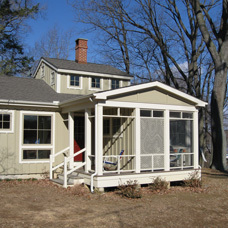 Overall, the new Porch Wing and the Lantern above substantially expand the space the family can occupy, adding significant value, from multiple points of view. We came up with ways to increase the perceived space of the house. We installed really large windows for more openness, and to capture views of the river. We expanded the core living areas upwards by adding an airy volume overhead, a "lantern" of windows, to bring daylight and airiness to the interiors. 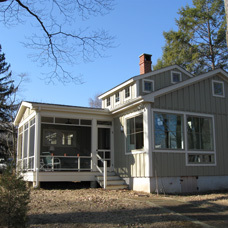 We added a new wing to give the house a generous entry and a river-oriented screen porch. 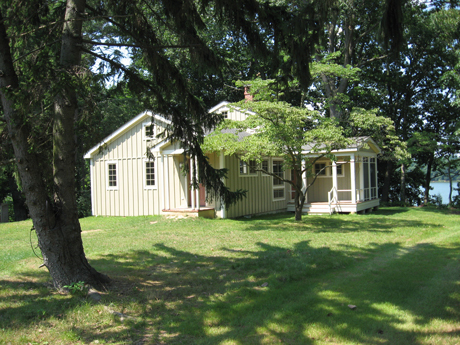 What we kept is "The Poetry of Cottage" - the intimacy of living small, and close to nature. We used board and batten siding (concrete to be green) and carefully crafted details that turned surfaces that had been a liability into assets of real value. Working closely with the Owners, we organized the interior as compactly as possible. Where we could, we broke up the boxy layout with slots of light. We enhanced the core family spaces by designing how each has views through its adjacent spaces to the panorama of trees and river outside. Small is not so small when airy, dappled with daylight, and open to nature. Overall, we've given the old cottage a promising new life. Our strategy has turned a shabby shoe box into a vacation home of considerable value for both family living and resale. 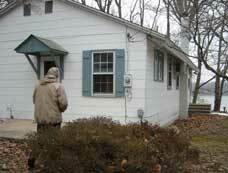 The Owners now have a cottage they can comfortably enjoy for many years to come.